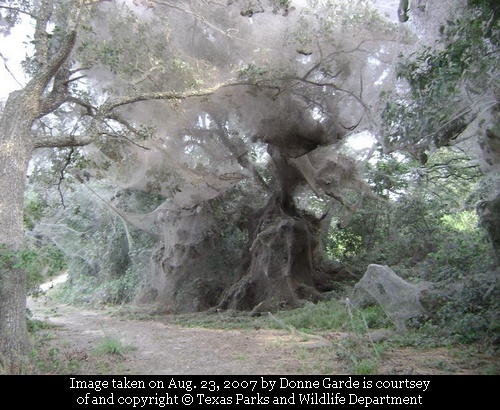 A huge 200 metres long cobweb (probably World's biggest spider's web) was discovered on August 06, 2007 at Lake Tawakoni State Park, Texas. The discovery was made by a park employee Freddie Gowin while he was mowing the trails at the Park. Normally spiders spin their web individually but this was a rare show of communal cooperation. The web was initially white but turned a bit brownish due to thousands of mosquitoes trapped inside. Unfortunately a few weeks after its discovery the web was blown away by a storm in the area but reportedly the spiders restarted building it. Present status is not known. I would like to tell you that the spider web is still there, but the wind and rain has taken it down the winter after we found it. The spiders were fewer this year and they did build more webs, but they were not very noteworthy. The photos from August 2007 are still the only photos of the web. I didn't take any this fall since there was nothing very spectacular to shoot. As one of the lucky people to be able to see this amazing web, I can say that I wish you could have seen it in person. It is something I will never forget. Caution: Those with Arachnophobia (fear of spiders) should view this YouTube with caution.